Good Cook Doris: How Do You #LoveAvocado? There are so many ways! How Do You #LoveAvocado? There are so many ways! Every Saturday after breakfast, I gather up my cookbooks along with a pen and paper to make my weekly grocery list. Whenever I ask my 2 year old son what we should buy at the store he always answer the exact same way without fail, “avocados and apples.” Those are the first things we see when we get into the produce section, but I am always happy to oblige. These days the little guy is loving avocado – with a spoon, mixed into chili, on sandwiches, and more. I don’t mind because over 75% of the fat in an avocado is unsaturated. Avocados are so versatile and can be used in so many different cuisines and ways. Avocados have long been a part of my diet. The rich, creamy flavor makes them feel like an indulgence even though they are a good fat. Cut in half, topped with hot sauce and either a little plain Greek yogurt or sour cream. Spread on warm toasty bread and topped with smoked salt. Blended with tomatillos, lime juice, and cilantro – used to top eggs, tacos, chili, soups, and more! Why are avocados so good? Avocados are nutrient-dense and have less than 1 gram of sugar per 1 ounce serving. Since they are sodium and cholesterol free, they fit right in to my goal to feed my family a well-balanced diet. What are your favorite ways to eat avocados as part of a healthy lifestyle? 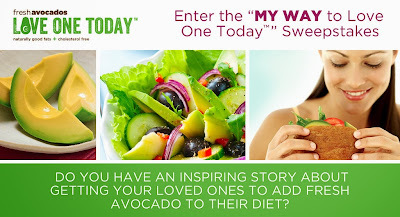 #LoveAvocado and have an inspiring story about getting your loved ones to add fresh avocado to their diet? Enter for a chance to win for yourself and to share avocados with someone you love. Discover a new favorite recipe and vote today for your favorite avocado recipe! I’m excited to explore more ways to incorporate avocados into my cooking . I’d love to hear how you incorporate them in yours! 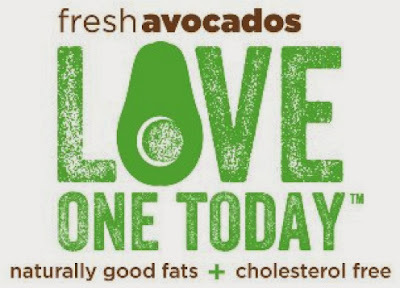 Follow along the Love One Today™ fun on Twitter and Instagram with the #LoveAvocado hashtag.